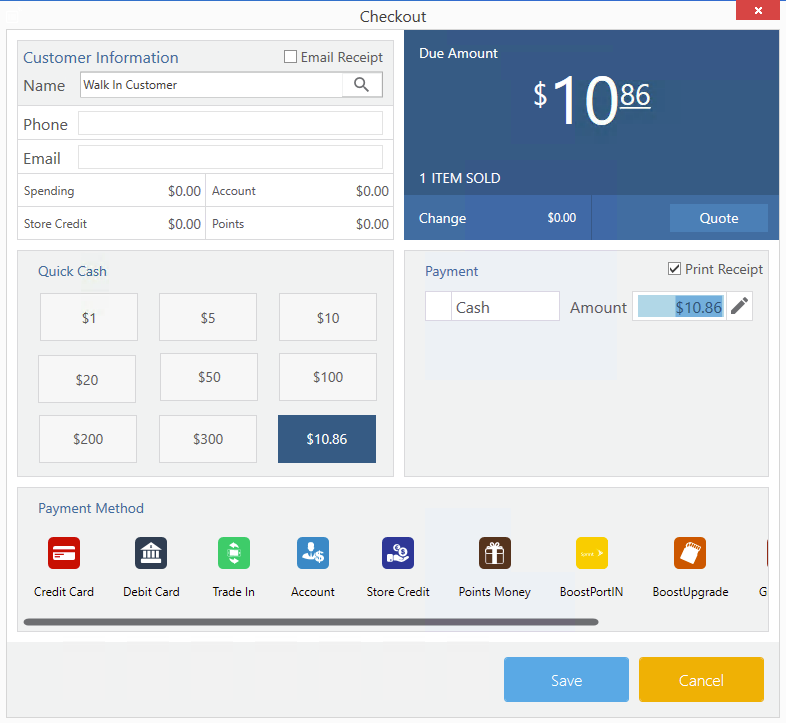 The checkout screen is where transactions can be saved along with the information about the form of payment for that transactions. It's simply the last step before a transaction is saved and a receipt is printed. From the checkout screen, you have the option to add the customer name.You can change payment type from cash to credit, debit card, or any other form of payment. You can also save the transaction as a quote that can be printed saved and used later on. Within the customer information section, you can select the customer who is part of the transaction. Simply add their name to the customer name field and press enter. If the customer exists within the customer list, their information will automatically be visible. If the customer does not exist, then you will be presented with the option to create one. -If you would like to email the receipt to the customer, enter the email address of the customer in the email field and enable " Email Receipt", above the customer information section. Payment methods are the options provided to the customers to pay the transaction. Learn more about payment methods here. Once a payment method is selected other than the cash method, the total amount will be entered into the new payment method. You have the to option to split the amount of each payment method by editing the amount. If the amount within any payment method exceeds the amount, the change will reflect this difference. By pressing on the quick cash button, it is assumed that the customer is paying with cash with an amount that is the same to the amount on the button that pressed. For example, if a customer is paying with a $50 bill, you may press the $50 quick cash button and the transaction will proceed to save and the correct change will be shown. In the case that you would like to save a transaction, along with the price of the items and the due amount, you can save the transaction as a quote. In order to do this, first, select the date the quote will expire. Then press "Quote". This will save the transaction into your list of quotes. Once a quote expires, it will not longer be valid for use. In the case that you may have missed the amount of change that have been given in the last transaction, you are able to view this information from the register. Just head to the register and within the bottom section of the register, under description, you will see "Last transaction amount"